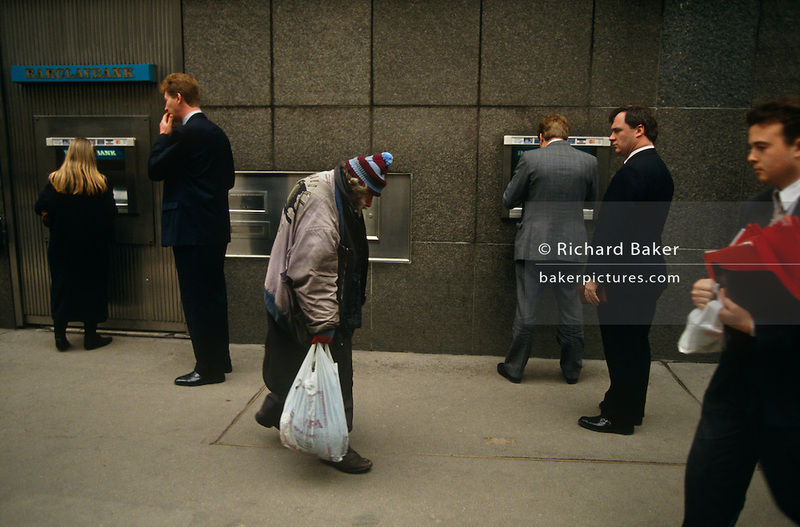 An elderly homeless man walks slowly past a Barclays Bank cash dispenser at which business people are either queueing or typing in their PIN numbers from cash accounts, or simply passing-by. One middle-aged gent stands eyeing the poor man suspiciously while other men of wealth, prospects and prosperity are tall and stand erect in smart suits and polished shoes, the homeless man is hunched and dishevelled, carrying a supermarket bag - perhaps containing all of his worldly goods. It is a tragic scene of extremes between the haves and the have-nots; the rich and poor; between people with hope and those in despair. This is the City of London, near Fenchurch Street Station where the UK's insurance companies are based and it is impossible to know if any of these men in smart clothes are the same age as the poor man.